Your General Dentist or "Occlusion Specialist" should not try to treat your underbite without first addressing your jaw alignment. The jaw needs to be moved back. Unfortunately, braces were designed to simply straighten teeth- NOT for jaw alignment. More unfortunately, the default treatment is still jaw surgery, which is highly invasive, risky, painful, impossible to predict reliably, and NOW in many cases, completely unnecessary. With extreme malocclusion and jaw deformities, surgery may be the only solution, however, the majority of underbites can be treated non-surgically and non-invasively with the JawTrac® jaw alignment and VENLAY® restorations! There is FINALLY a new option that can save patients from undue pain and suffering! Read on to learn about the revolution of bite correction. 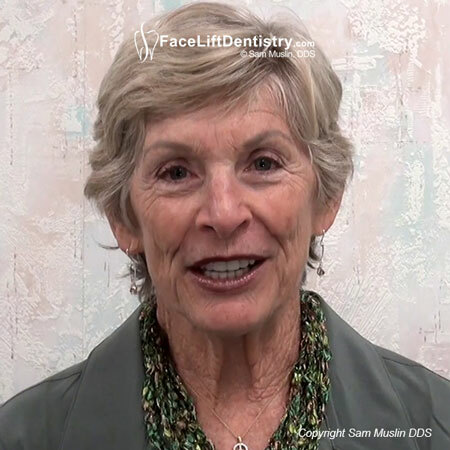 Dr. Sam Muslin trademarked the Face Lift Dentistry® bite correction method as "the non-surgical and non-invasive mechanical synchronization of the ideal jaw position, bite and TMJ function that idealizes the shape of the patient's face, profile and their physical comfort". When a patient can benefit from the Face Lift Dentistry® bite correction method, they are getting a defined standard of bite correction with a specific method using JawTrac® and VENLAY® Restorations. An underbite, or mandibular prognathism, is a Class 3 malocclusion or "bad bite" and occurs when a person's lower jaw (mandible) protrudes or extends forward, and in front of the upper jaw (maxilla), giving the chin and lower teeth prominence. Traditionally, the majority of underbite cases, and even overbite cases, could not be corrected by non-surgical bite correction methods, such as braces or headgear. What is a Severe Underbite? In its severe form, an underbite can distort the shape and appearance of a person's face, and even dramatically affect their speech. These extreme cases are also called skeletal malocclusions. Orthognathic jaw surgery is mostly the best choice for an ideal result. However, many of our patients tell us that they have a severe underbite and were told that they require jaw surgery with years of braces in order to get a correction. With evaluation and testing, we often discover the severity of the underbite is not extreme and can still be treated with non-surgical VENLAY® Restorations. The study of occlusion is the relationship of the contact between the upper and lower teeth. The position of the lower jaw and how the teeth guide the lower jaw to the best mechanical and physical position is the most critical component in the correction of malocclusion. Malocclusions have many different classes. When dentists talk about malocclusion they are referring to how the teeth meet together. There is a close relationship between malocclusion and TMJ problems. Class 1 occlusion is considered the most ideal. However, patients can still experience TMJ problems with a Class I bite. Class 1, Class 2 and Class 3 malocclusions are mechanical imbalances that should be treated with the least invasive method. Jaw surgery is highly invasive, and porcelain veneers usually require a lot of tooth grinding. Fortunately there is now a treatment option that is non-invasive and non-surgical. The patient in the first photo thought that jaw surgery and braces were the only choices with Class 3 malocclusion but she did not want the pain, loss of time and the risk of jaw surgery, so she searched and found the non-invasive and non-surgical method online and was pleased to discover that it was not too good to be true. In the second photo is a patient with showing his mandible in front of the maxilla with overlapping teeth and a prominent chin. He does not have teeth crowding but he does have a posterior cross bite, and he also refuses to have jaw surgery. 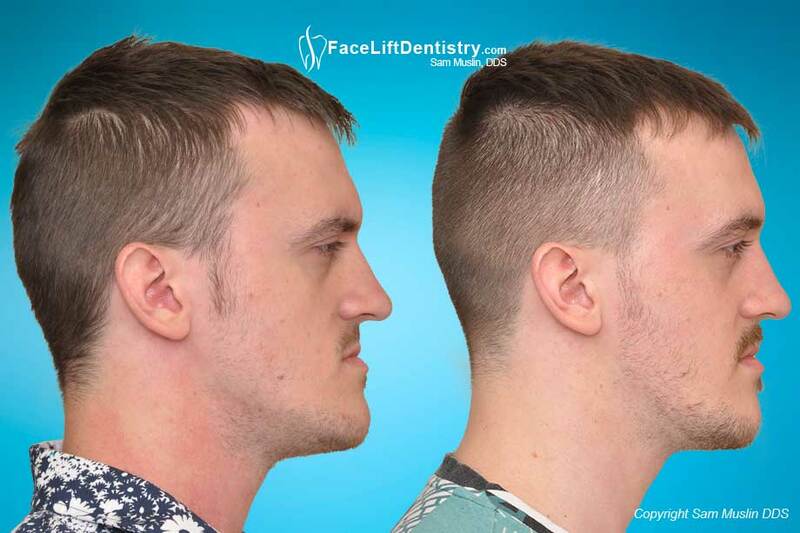 He searched for an alternative treatment as he did not want orthognathic surgery. 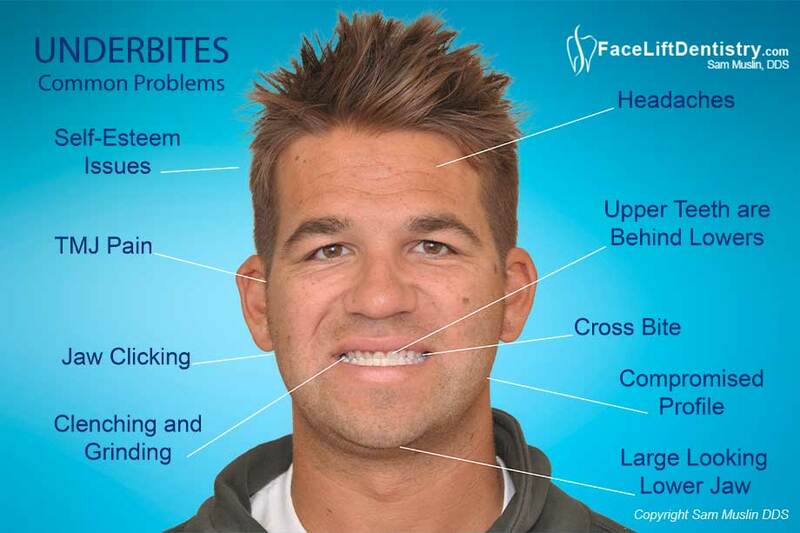 Some patients have tried orthodontics, braces, Invisalign® and nothing worked. Some have broken teeth and premature wear. Other patients have broken porcelain veneers because the bite was not corrected. Other patients break teeth because of misaligned teeth and a misaligned bite. If a patient does not feel their best, they will not look their best. If a patient gets injected with wrinkle removing facial fillers, a face-lift or plastic surgery, or jaw surgery, they still may not feel younger. If they do not feel good, they will experience the facial signs of aging. The treatment that reverses aging must improve the health of the patient and help them experience an actual physical improvement such as headache reduction, neck pain reduction, etc. Patients can have no symptoms but still can be physically compromised and not realize that their bad bite is connected to problems such as waking up too much, digestion problems, neck and shoulder pain, etc. Other patients have headaches, jaw joint pain, locking of the jaw, clicking and popping jaw joints and neck pain. This patient has a protruding lower jaw, a moon-shaped face, the chin juts out and appears large. But, when the jaw was measured, it was actually normal in size. She needs profile correction, but she never realized that her profile could be corrected non-surgically and non-invasively. Patients with underbites are very self-conscious of their lower jaws, and when they learn that their lower jaw is actually more normal in size, they are excited about the treatment. 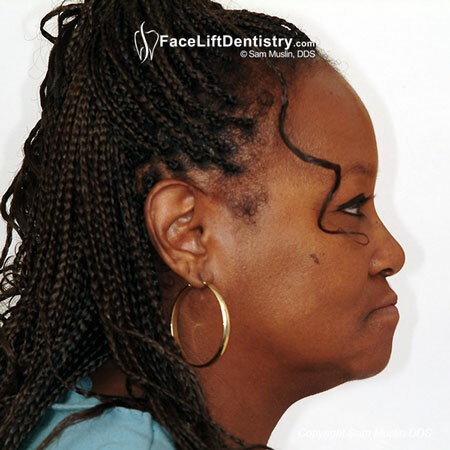 This patient's lower jaw was in an unhealthy position until her bite was corrected using the Face Lift Dentistry® method. An open bite and cross bite can cause TMJ related issues such as jaw clicking and popping along with speaking problems. Patients with open bites cannot speak their words clearly and have jaw joint problems. Often they cannot chew or digest food properly and may have snoring issues, sleep apnea and mouth breathing because of the open bite. Watch this patient's video testimonial as he explains all of his issues and the results of his treatment. Prognathism is a class 3 type of occlusion whereby the lower jaw and lower teeth are in front of the upper jaw, which is referred to as a prognathic or protruding jaw. An abnormal protrusion or protruded mandible is when the entire dental arch of the lower is in front of the upper arch with varying degrees. A mild and moderate prognathism can be treated without jaw surgery in most cases with the non-invasive high tech method. Severe prognathism generally requires jaw surgery for the best resul,t but even severe prognathism can be improved non-invasively and for many patients that refuse jaw surgery. Prognathism is generally hereditary because of the difference in size between the large lower jaw and smaller upper jaw. Bad chewing habits and thumb-sucking generally do not cause the protruding lower jaw. Thumb-sucking often causes the chin to look small because the lower jaw is pushed back that is generally associated with an overbite whereas an underbite classically causes the chin to look too large because the jaw is protruding forward. Protruding chins and underbites corrected without surgery or braces, using the non-invasive Face Lift Dentistry® method with JawTrac® to find the best jaw position and VENLAY® Restorations to correct the bite. Correcting or treating prognathism depends on the severity of the jaw size problem. The greater the severity, the more surgery and braces are indicated. However, many patients can have the only bite, face and profile correction method that is non-invasive and non-surgical. Is Face Lift Dentistry®Too Expensive? There is a big misconception about the optimal jaw position. The ideal jaw position is commonly defined in terms of the position of the teeth more than the position of the jaw. The "dentists description" is, " the anterior teeth should have 1mm of overbite, and the molar relationship should be in the class one position". What about the jaw? Many people have a class I molar relationship and one millimeter of overbite yet still have jaw joint or TMJ problems. Why? Because even though they have 1mm of overbite and a class I molar relationship, the lower jaw and the bite are in the wrong positions. The person that has the best tooth size for their faces, a wide smile that supports the face, the ideal jaw position for their bone structure, the bite that supports the ideal jaw position, the most advantageous shape to their faces and the optimal facial profile will look and feel younger than most other people their same age. Not very many people get to live their lives with the best of everything. We would have to be very lucky to have it all but the Face Lift Dentistry® method is designed for those of us with overbites, underbites, TMJ problems, small chins, short round faces, protrusive chins, premature aging, short, worn down teeth, teeth that are too small for our faces, large teeth, buck teeth, etc. What is the Correct Bite Position and Optimal Jaw Position? What is the correct bite position? The optimal jaw position is when both jaw joints function harmoniously with the patient's bite. The ideal three-dimensional position of the lower jaw (the mandible) needs to be located within the head of the condyle functioning in the center of the socket of the skull. There needs to be enough space for the meniscus to move in harmony during all normal movements of the mandible as chewing, speaking, resting and smiling functions, without the TMJ clicking and popping. This ideal jaw position relieves stress and strain in the TMJ region along with the head, neck, face and lower back areas. The ideal jaw position can help us look younger and feel younger and is a boost in self-esteem. 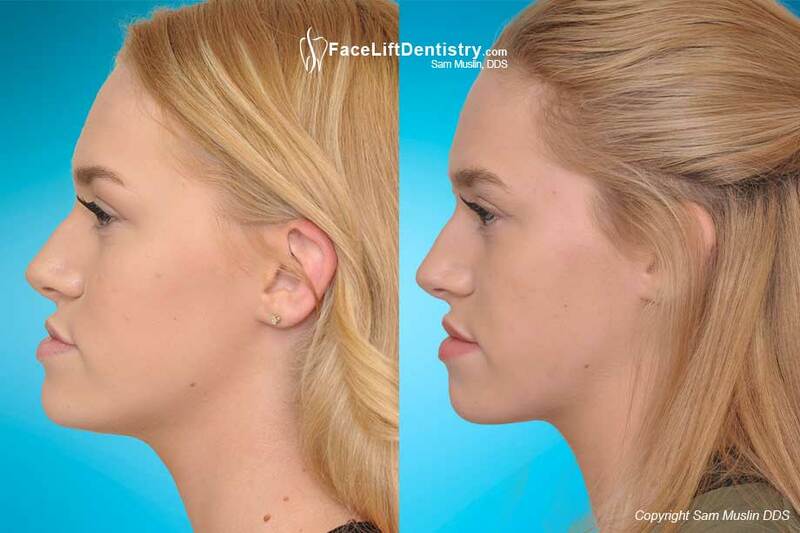 Not only did this treatment address the TMJ-related problems she experienced, the correct jaw position greatly enhanced her facial aesthetics. In its rudimentary form, the jaw is a mechanical hinge. The jaw should be functioning in the center of both joints. Try open and close a door with a broken hinge and you'll understand the importance of a perfectly functioning hinge. Jaw alignment problems need to be addressed at the hinge – or more precisely, at the Temporomandibular joint (TMJ), which connects the lower jaw (mandible) to the skull. Jaw alignment treatment is about getting the ideal three-dimensional position for the lower jaw to function properly. Deciding how to fix an underbite is a truly personal choice. Your regular dentist, qualified oral surgeon, or orthodontist, will most likely suggest jaw surgery and braces. For some patients, this may be the best course of treatment. However, jaw surgery has risks, and there are potential problems after surgery. Patients miss work or school and spend a great deal of time going to the orthodontist for braces. You should weigh this up against a high-tech and proven alternative treatment to surgery for adult patients which offers an effective, predictable, and non-invasive option. This option, perfected over many years by Dr. Sam Muslin, is becoming increasingly more popular. 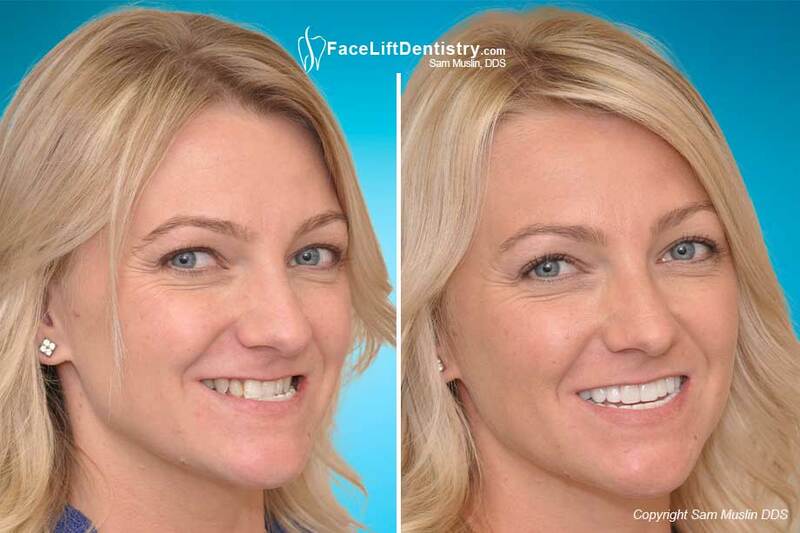 This non-surgical option is known as the Face Lift Dentistry® method, using JawTrac® jaw alignment and VENLAY® restorations. Cosmetic camouflage vs. real underbite correction - what is the difference? Porcelain veneers are cosmetic camouflage and do not improve the facial profile or the bite. The jaw surgery and the non-invasive alternative treatment are real bite corrections. The severity of the jaw misalignment is part of the treatment decision. As an example, a patient with a severe underbite may choose the non-invasive method even though the results may not be as ideal as the potential of the jaw surgery method. Can Porcelain Veneers Fix Your Bite? In the before photo on the left she has porcelain veneers and cosmetic dentistry. It is evident that her jaw is not in the best position. Porcelain veneers often aggravate a bad bite. 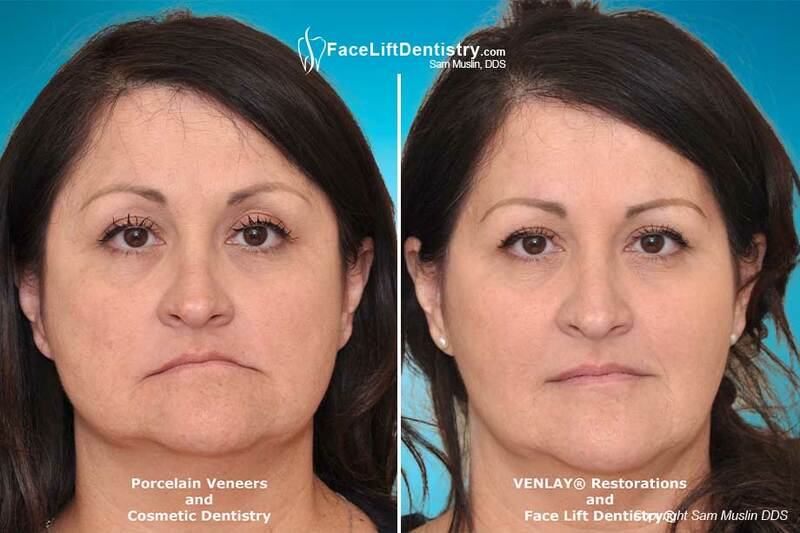 In the after photo she was treated with VENLAY® Restorations and the Face Lift Dentistry® method. Porcelain veneers are bonded to the outside of the upper teeth to make the smaller maxilla appear larger. Porcelain veneers can not correct an ubnderbite. Porcelain veneers do not improve the shape of the patients face and do not improve the patient's facial profile. Most dentists that advertise, "fix an underbite with porcelain veneers" cannot use the words "correct the underbite" because they know they are using "cosmetic camouflage" instead of dental health care and bite correction. The dangers of veneers are that the TMJ bite problems, and self-esteem issues associated with underbites have not been corrected. Porcelain veneers are mostly highly invasive that cause problems long term. Seeing that we are living longer than ever before, more problems manifest in later years. There are some considerations to think through before attempting bite correction treatment for malocclusion, such as an underbite. The first factor to consider is the age of the patient. According to the American Association of Orthodontics, an orthodontist should see a patient between the ages of 8 and 14. The idea being that bite correction is more easily performed during a child's growth spurt. While baby teeth are still present, orthodontists can spot problems with jaw growth, lower risk to protruding front teeth, correct harmful oral habits, and guide permanent teeth into a more favorable position that promotes better oral health. Another factor a patient should consider is the physical dysfunction an underbite causes in their daily life. Some people experience speech impediments such as lisps, while others experience low self-esteem. Teenagers are extremely vulnerable to bullying and other teasing behaviors, and underbites can elicit undue stress at a particularly difficult time in their lives. Secondly, a patient must consider the severity of the underbite. If it interferes with a patient's ability to chew or speak, or makes them feel self-conscious, then it may be worth considering. Since treatment plans for underbites can be lengthy, a patient must decide for himself or herself whether they can truly commit to treatment that takes years. They must also fully understand both the risks and benefits involved with the jaw surgery method, porcelain veneers and cosmetic camouflage, or the non-surgical and non-invasive VENALY® restorations using the Face Lift Dentistry® method. The treatment consists of braces for about a year, the protruding jaw surgery for the lower mandible and sometimes the upper maxilla, hospitalization and then braces to finish the treatment. Invisalign® can sometimes be used, but traditional orthodontics is most often recommended. Dental oral surgery or underbite surgery risk is considerable, as patients don't always heal predictably. The jaw surgery cost is an issue but the jaw surgery alternatives are also costly. Sometimes the braces and jaw surgery treatment require extracting teeth. Why Do Dentists Tell Me I Have to Have Jaw Surgery? When malocclusion issues cannot be corrected by braces alone, surgery is another option. Orthognathic or jaw surgery is a procedure that can be very complex depending upon the severity of the malocclusion and the cause behind it. In general, the surgery involves two possible procedures: cuts in the bone to realign the upper jawbone forward, or to cut the bone and repositioning the lower jawbone to realign the chin and lower teeth back. TSome cases may also require a combination of the two procedures. For those suffering from moderate to severe underbites, bite correction in the form of orthognathic surgery is an excellent option. However, since this is an extensive procedure, no one should commit to this lightly. One major factor is orthognathic surgery cost. Dental or medical insurance may or may not cover the entire surgical procedure. The lost opportunity and discomfort cost, due to the long healing and treatment process, often persuade patients to opt for the quick, non-surgical, alternative solution. This remains the less expensive solution – if opportunity cost and discomfort are not taken into consideration. Braces cannot really solve the jaw size discrepancy without jaw surgery, so teeth get extracted that should not be extracted and too often the teeth are tipped back towards the patient's tongue. The teeth may fit a little better, but cosmetically it leaves a lot to be desired. It is seldom, if ever, a sustainable solution. Can Invisalign® Fix My Protruding Jaw? No, Invisalign® cannot fix most underbites because the jaw position cannot be improved, the jaw size difference cannot be corrected, the crossbite and the occlusion cannot be corrected and the final bite compromised. Invisalign® cannot improve the chin size, the facial profile, the jaw position or the size and shapes of the teeth. To correct underbites, just about every oral surgeon and orthodontist recommends braces first, jaw surgery second and braces again over a 2 to 3 year period. Healing is not always predictable and there have been some very difficult complications after jaw surgery, and some great successes. Invisalign® may be able to be used in combination with jaw surgery instead of braces. Neuromuscular dentistry uses computerized equipment to measure jaw movement and related muscle tension. As per this article published in the US National Library of Medicine, neuromuscular dentistry remains controversial. In spite of this, it has turned into a highly profitable business model as patients are desperate to find solutions for jaw misalignment and TMJ/TMD problems. Insurance companies do not usually cover the TMJ- related costs because of "the lack of a scientific evidence base for such a treatment." The TMJ Association (a non-profit patient advocacy) states that Neuromuscular Dentistry treatments are based on beliefs, not scientific evidence. Furthermore, Neuromuscular Dentistry is not recognized by the ADA (American Dental Association) as a dental specialty. Unfortunately, electronic equipment and the tens units do not respond consistently enough to make the results reliable for a variety of reasons. Relying on electronic equipment to determine the ultimate position of the jaw position can be a risky and highly invasive treatment plan involving grinding down the healthy teeth for a full mouth reconstruction or bite correction. Once the teeth are ground down, it cannot be reversed. You cannot undo highly invasive dentistry. Neuromuscular dentistry is a conceptual approach to realigning the jaw, based on electronic jaw tracking readings. 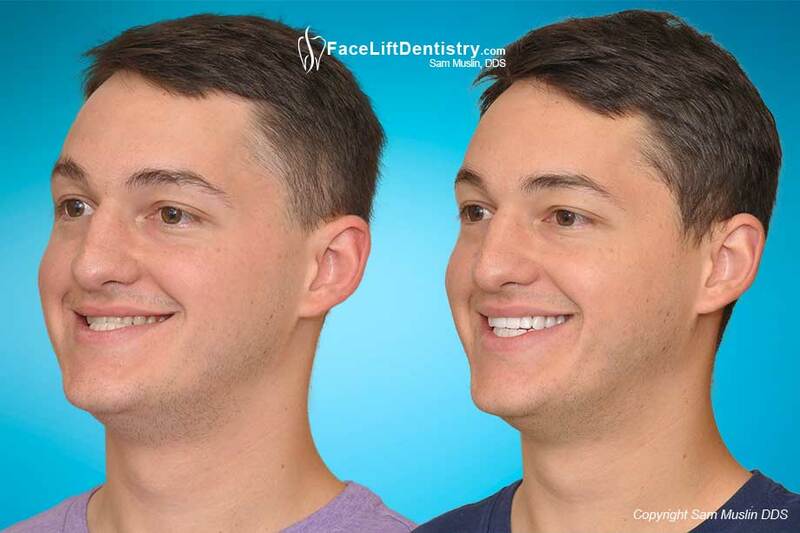 In stark contrast, Face Lift Dentistry® offers a mechanical solution to a mechanical problem using an imaging system that allows the dentist to see the position of the lower jaw is in the most relaxed position. The theory being, "get the jaw in the best position using an imaging system to see what you are doing, test the position to be sure the patient has improved and then build the bite to augment the jaw position function, the shape of the patient's face, the profile, speaking ability, give facial support etc. From a dentist that has experienced the neuromuscular dentistry method and found it to be so inconsistent that treating the patients were far too risky vs. the same dentist that developed a mechanical method that allowed him to actually see what he is doing which made treating his patients highly predictable. One of the greatest features of the Face Lift Dentistry® method is that none of the healthy teeth need to be ground down. Patients have had their entire bite reconstructed consisting of every tooth in their mouth that involved replacing the old crowns, fillings, veneers and saving all of the healthy teeth in as little as just one week. Other patients that need dental implants and possibly gum treatment can take longer. Some patients get their upper teeth done in one year and then the lowers in another year. The variations to his treatment are endless and are tailored to the patient's dental health and financial ability. On the first visits we discuss the possibilities and possibly take records if the patient wishes to move forward. Treatment can start immediately. On the first visit, the patient will actually see the treatment results, as the doctor will demonstrate how their faces will look after treatment. This is superior to computer imaging because computer imaging is less accurate than the patient's actual face. There is nothing better than seeing your own face utilized in understanding the type of the results that are possible with his care. Each patient will understand how long it will take, what exactly will be done and how it will work for them. Each patient generally becomes very enthusiastic because of the non-invasive and tooth preserving expertise of his exclusive Face Lift Dentistry® treatment. But, far more importantly, is that the bite correction treatment for neuromuscular dentistry is highly invasive with the teeth being ground down by the dental drill for porcelain crowns or porcelain veneers. These dentists loose the original bite position when they grind down healthy teeth. Whereas, the Face Lift Dentistry® method is totally non-invasive as none of the healthy teeth are harmed by the dental drill. The healthy teeth stay intact and the treating dentist can see the actual change in position of the lower jaw on the articulator. There is a huge advantage in this technique and another advantage for the patient because it is far less traumatic. One of the greatest advancements in modern dentistry is non-surgical, non-invasive underbite correction. This treatment is a true bite correction and not just cosmetic camouflage with porcelain veneers. The treatment does not require grinding down healthy tooth structure and improves the natural facial features of the patients face. Actual patient treated without jaw surgery, braces or with porcelain veneers. 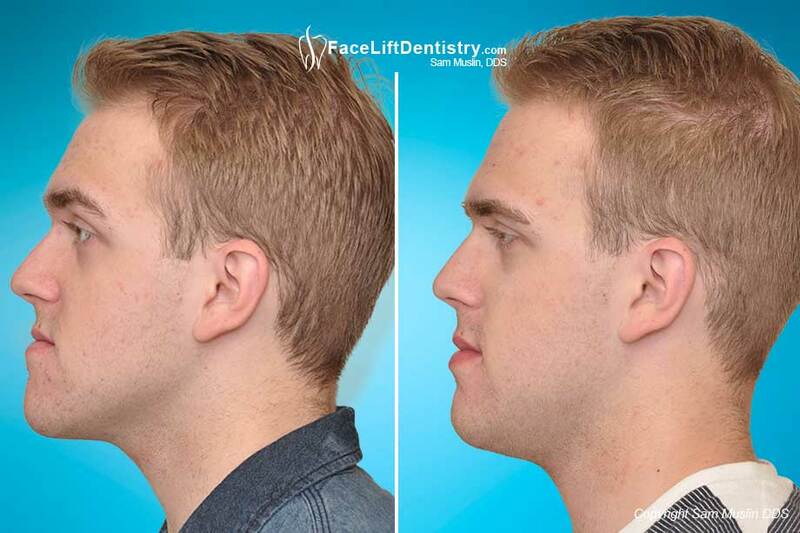 He was treated with the only non-invasive method that corrects the bite and improves the facial profile: Dr. Sam Muslin's exclusive non-invasive Face Lift Dentistry® method using VENLAY® Restorations. 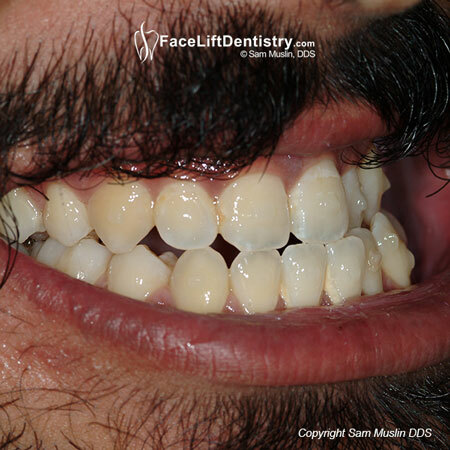 Dr. Sam Muslin's ability to design the teeth to support the face while developing the jaw position and facial profile while combining all of the cosmetic elements of traditional cosmetic dentistry into an elaborate treatment sequence that is easy for the patient may very will be the future of bite correction. With over 30 years of cosmetic and reconstructive experience and one of the world's most comprehensive before and after photo galleries he has "raised the bar" on comprehensive dental care. There are a lot of cosmetic dentists but only one Face Lift Dentist®. Far too many people are physically compromised because of their bite and are suffering unnecessarily. VENLAY® restorations are non-invasive and a painless, safe and predictable from of treatment that correct bites, improve facial profiles and resolve many TMJ issues. The most difficult part of this treatment is helping the patient believe that this treatment is not "too good to be true". 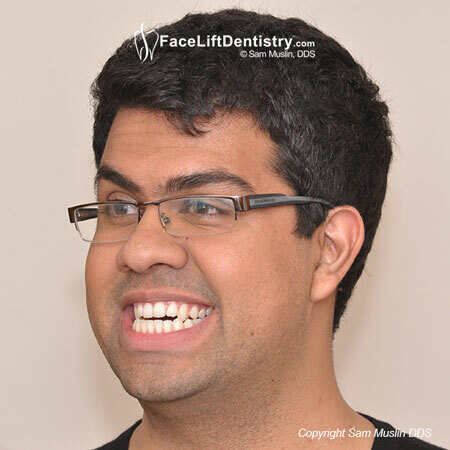 The second most difficult part of the treatment is to help the patient understand that this is not a "smile lift". This is a specific method developed and trademarked in order to avoid confusion with any other methods and it only takes a week or two. The secret to this underbite correction method is to know the natural location for the patient's bite and jaw position. 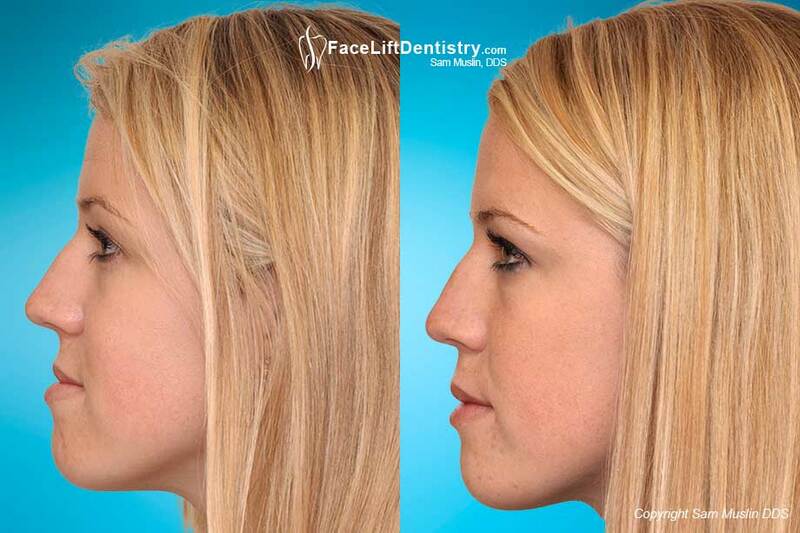 This patient's chin looks larger in the "before" photo because her bite makes her chin look larger than normal. The chin looks smaller in the after photo because the bite and chin position is idealized. 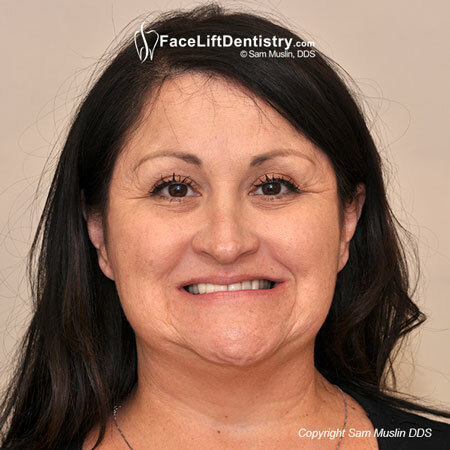 The profile can also be significantly improved as this treatment using Face Lift Dentistry® method with VENLAY® restorations that actually corrects the patient's bite. Learn more about the Cost of Underbite Correction here. Call for a consultation with one of Dr. Muslin's treatment coordinators. They can help you understand how the treatment will work for you, or you can make your appointment and Dr. Muslin will talk with you and show you how he can help you directly. Need to Learn More about Non-Surgical Underbite Correction?